Steffen Mengel isn’t only the current German table tennis champion but also the “world champion” of Vierertisch. This game is table tennis but played in four tables. However, this isn’t new, because the “World Championships of Vierertisch” has been held since some years. While some people in the USA are trying to put table tennis and racquetball together, other in Germany do the same with table tennis and tennis. 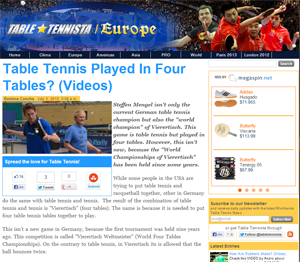 The result of the combination of table tennis and tennis is “Vierertisch” (four tables). The name is because it is needed to put four table tennis tables together to play. This isn’t a new game in Germany, because the first tournament was held nine years ago. This competition is called “Vierertisch Weltmeister” (World Four Tables Championships). On the contrary to table tennis, in Vierertisch its is allowed that the ball bounces twice. Some professional players also practice this sport and Steffen Mengel is one of them. He isn’t only the German table tennis champion but also the champion of the last two editions of “Vierertisch Weltmeister”. In the tournamnet held on 29th and 30th June, Mengel overcame Andreas Greb, an experience player in this tournament, in the final.